Do you really need to read another opinion piece on Jeremy Clarkson getting sacked? God no. What a joke. Surely BBC could have found another way to deal with this, and at least finish up the season before punting Clarkson. We all get/understand the difficulty dealing with him, but he was most definitely the lowest common denominator of Top Gear. What I mean is that any product aims for a target market, and that product has to be understood by the target consumer, and Clarkson was easily understood by the average middle-class dad who's given up 'that' life of fast cars and crazy adventures to raise a family. It was so easy to imagine themselves doing that job (who among us hasn't had that recurring thought, "I could do that just as well" when watching TG?). Even us yanks could easily accept that premise, even though the average American has some strange hostilities to them Europeans (I.E. conservative republican types always railing on the european system, be it financial, employment, or general BS). Clarkson is a marketer's dream, as long as they can get over the nonsense PC crap that his comments elicit from an apparently bored public (most of whom never actually watched the show). He quite literally represents every middle-aged white working stiff and the mentality of people of that age - being assaulted on all sides by modern 'standards' of behavior, never knowing if some innocent statement might be taken as a racial insult by some fraction of a percent of the population. Plenty of people my own age (mid 30s) are starting to feel the same way, but it's most apparent among folks in the late 40s and 50s - age groups in flux, trying to stay relevant without losing their identity. You could see the same progression on Top Gear as, over the years, the cars and technology changed dramatically, and the standards shifted to embrace newer thinking. When I was in high school my autos teacher told me straight up, forget the wrenching, get yourself into the electronics side of things, and he was right. Clarkson is about the same age as that teacher, and you can kind of see the panic and struggle to embrace the new tech. What I'm trying to say is, he/they were so popular because they are quite literally living breathing examples of the average gearhead dude next door, the kind of guy you know you could sit down and chat with over several pints, maybe get into an argument with, but still completely relate to despite his wealth/fame/celebrity. Obviously as adults we need to be flexible and learn/grow with the times, and I'm not condoning the more...off color stuff and comments he's made, although I'll admit I didn't find any of them terribly awful compared to the constant assault of crappy things people do to each other every day. In the end BBC was going to get it from some side, either the fans of TG or the legions of sensitive nanny types who looked very hard for things to get upset about. Thing is..."highest rated and grossing show" on the BBC, you can't help but think they've really screwed up on this decision. We know the other two won't be back without JC, and I simply will not watch whatever they come up with to replace them. meanwhile there are plenty of examples of people who've done much worse, still reveling in celebrity and their tv shows or whatever, and none of them bring nearly the kind of viewership TG did to BBC. It's just stupid. I didn't want it to end like this, but you have to admit the show was getting a little long in the tooth. How many more remote places could they ship a Ferrari to show it can't make it over a speed bump. Well... so long. I will not miss him that is for sure. Jeremy Clarkson (aka Bangers and Mash) needed the boot. Lets be honest Top Gear is kinda cheesy anyway. It was always just a marketing promotional vehicle for inferior British cars. We're all grown up enough to see this and acknowledge publicly. That little contest that they used to have to see which professional driver can go fastest in that little dinky production car, that whole thing was rigged, the times and everything, just like professional wrestling. All so that little sycophantic suckers sitting at home will keep watching that televised tripe. Its time for Chris Harris to step up and have his own big time show. Just like professional wrestling. I agree with that and that's why I think you've been watching the wrong show. Top Gear is not finding out what car is the best or the worst, it's about being entertained just like professional wrestling. Jeremy Clarkson is Paul Heyman and no one can cut a promo like Heyman. On a more important subject , why was the axis of oversteer logo placed on a 2007 or 8 williams helmet ? Of all the cars, drivers, years.... Just curious? Dead wrong. Tiff nails this one. “He needs to grow up” Jeremy Clarkson? I often hear people, usually wives, girlfriends and mother-in-laws, says “he needs to grow up” referring to the laddish behaviour of a husband or boyfriend. Immature Teenage boys ‘laddish’ behaviour is is a product of their hormones fuelled by action movies, video games and social media. Thankfully most mature and become useful citizens, the odd few don’t. They grow up to be football fans/hooligans, racists, wife beaters, gay bashers and dare I say terrorists. Jeremy Clarkson did grow up but was smart enough to cash in as the Lads Lad. The derogatory and racist remarks and the following ‘tongue in cheek’ apologies only endear him to his loyal followers. They know that this is necessary to placate the PC ‘bleeding heart liberals’ who are out to ruin their way of life. Jeremy obviously believed himself to be untouchable. In the real world anyone punching another employee would be fired ON THE SPOT. How many of his loyal followers have longed to likewise. Perhaps, the fact that a petition for Jeremy’s reinstatement had a million signatures means the ‘few’ are becoming the ‘many’. Are we living in a world where the nasty are in the ascendancy? 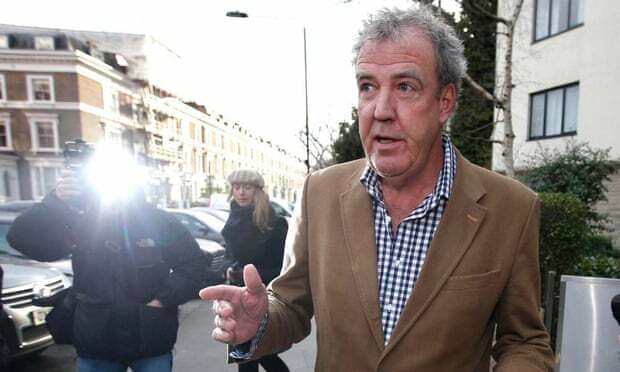 I'm not sure how you think a producer is Clarkson's boss.... Look, I had a beloved great aunt who always said, " The moment you lose your temper, you lose". But it's a man's world, with this kind of thing at stake, you work it out. Chris Harris wrote an interesting piece on Jalopnik where he points out how it's not just Clarkson but the whole TopGear system that is in jeopardy. "Don’t get your knickers in a twist. Don’t take to the internet and say our review of the new Lambo was a bit meh (whatever that means) because we didn’t take the diffs apart to see how they worked. And that we’ve been rubbish since 2006. If you want the sort of show you like, why not make it yourself?" "You have Top Gear and Fifth Gear and Chris Harris and, er, that’s it. So, in order to shine, all you have to be is better than Captain Slow, a midget, a pensioner, an orangutan and a monkey. Which isn’t hard"